Many women find that their buttocks and thighs don’t get slimmer even though they spend a lot of time working out, but their breasts reduce in size. It can be explained plainly, when the body is in dire need of calories, it starts expending the fat reserves proportionally. Since the breasts contain glandular, connective and fatty tissue, this process also affects them. The ratio of tissues is determined genetically. Women with a lot of fat get smaller breasts faster than women with less fat. 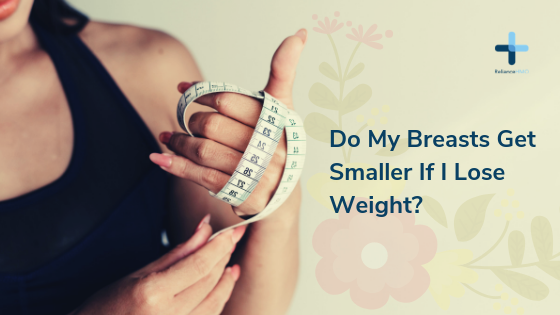 If you’re trying to maintain your breasts’ size or make them look fuller when you’re trying to lose weight, you’ll need to strengthen the muscles with strength exercises. Also, to maintain the elasticity in your mammary glands and prevent sagging, experts advise you not try to lose weight really quickly. Eat healthy and include a lot of vegetables in your diet, lean protein too.